Today: A chocolate cookie to bring in the holiday spirit. I am very sorry to report to all of you that I am going to force you to buy hazelnut flour. Or if you live in a place like I do, where you can purchase all manner of bad salad dressing, savignon blanc, and those weird rubber bands that kids make bracelets with but no no no hazelnut flour, then you will have to grind up nuts, as I did. You may have some random bits of nut in your Bittersweet Chocolate, Orange and Cardamom Cookies with that process -- which actually is fine. Don't worry about it. So guess what? I LOVE THIS COOKE! It has the subtle surprise of the cardamom, but it does not hit you over the head with it. It has enough chocolate to make chocolate-cookie fans pleased, yet the thrill of orange for those looking to be cheeky. 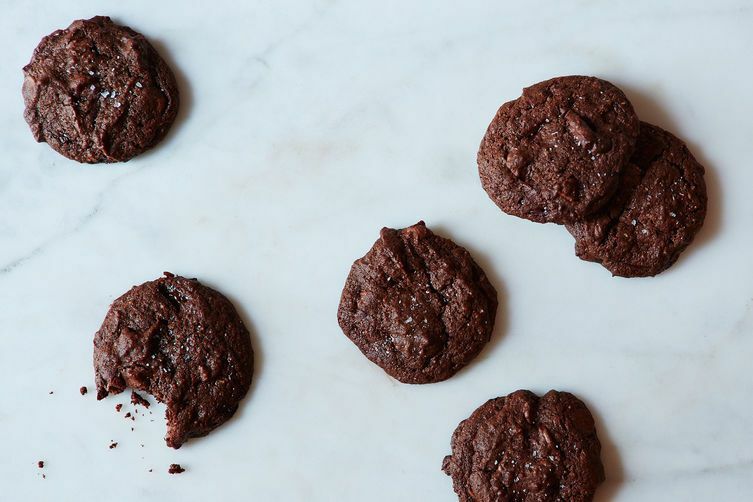 No one else will bring this type of cookie to your holiday exchange, so you should. I have only one comment on the method, which is that I found 350° F too hot for this cookie. Jenny proclaims that 325° F is where you want to be -- same approximate cooking time. Jestei, these look and sound absolutely scrumptious! Cardamom and dark chocolate, heavenly! I have no oven right now, otherwise I'd be whipping up a batch now, even though it's nearly the middle of the night. Can you use a different type of nut flour or flour? We have a nut allergy but these cookies sound amazing! I would suggest that you specify "Toasted" Hazelnut flour, as that has a superior taste. Definatley worth keeping on hand. It also works wonders in ruglech as a filling, and is a nice addition to the batter for regular sugar cookies (less sugar, more taste).